"Cyrus Wakefield, the man for whom the town was named in 1868, built the imposing house, known as the Wakefield Mansion, in 1863. The mansion was built next to the first house Cyrus and Eliza purchased in South Reading in 1851 'lying a short distance from the business center of town,' where the Americal Civic Center now stands. He later erected a 'splendid residence' with a barn in the rear, a gazebo, orchards, canals, greenhouses, and a summerhouse, which can be seen in the picture. For over 50 years, the Wakefield Mansion and estate was known as a 'showplace of the suburbs.' After Cyrus Wakefield's death in 1873, his widow remained in the house until her death in 1877. Since the couple had no children, the estate was left to their newphew Cyrus Wakefield II, who left the estate to his three children upon his death in 1888. 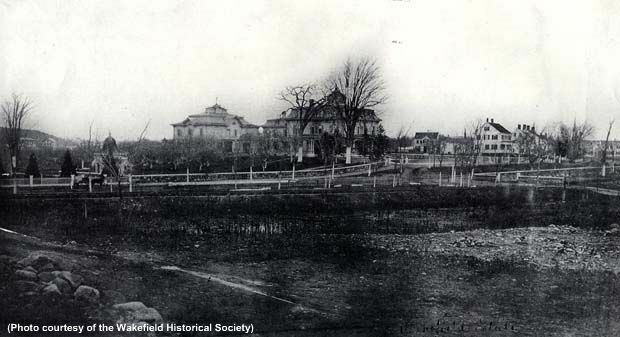 In 1913, after 'protracted discussion and much acrimonious dispute' in town meetings, the town voted to buy the mansion and its property for the future home of the high school from George Wakefield for $25,000. The mansion fell into disrepair and was razed by the City Building Wrecking Company of Charlestown in the early 1920s, with some of the materials used in the new high school. The high school was built on what is now the Galvin Middle School parking lot. The new school opened on June 4, 1923." - Text from calendar by Jayne M. D'Donofrio. “Wakefield Mansion, Main Street, circa 1880s,” NOBLE Digital Heritage, accessed April 22, 2019, https://digitalheritage.noblenet.org/noble/items/show/7145.